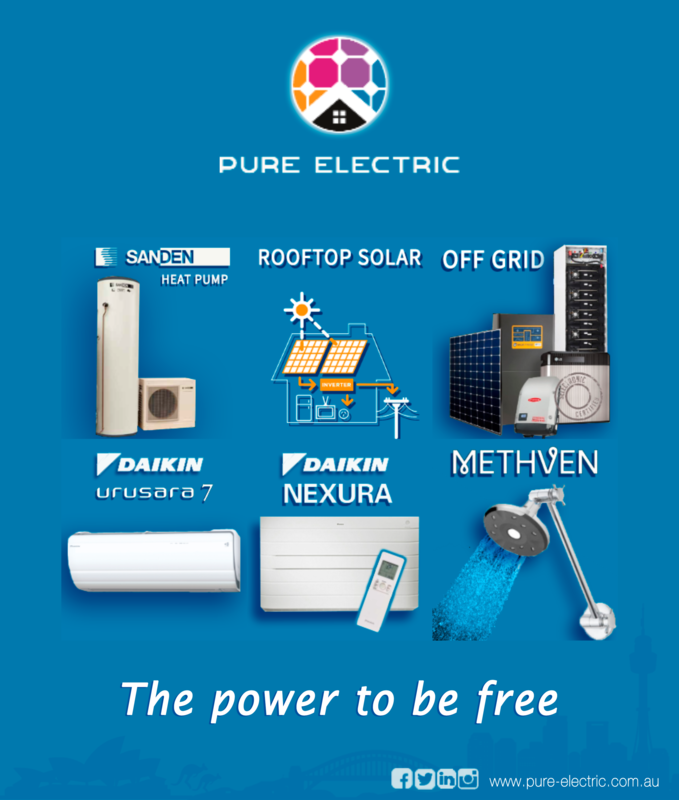 Pure Electric Solutions is a professional energy company providing products and consultancy services across all efficient electric applications, your one stop shop for the highest quality efficient electric appliances, solar, storage, industry knowledge and research. We will work with you to quickly make energy savings, eliminating gas and powering it all with solar. Our expert team is lead by veteran renewable energy engineers who will expertly size your hot water, cooling, heating, solar generation, battery storage and/or off grid requirements. We're ready to guide you on your way to no energy bills and pure electric freedom. At Pure Electric, we pride ourselves on helping our clients reduce their bills, get off gas with the ultimate goal of removing your gas meter (and daily service charge). We have serviced hundreds of clients nation-wide, being the only Australia wide Sanden dealer with the best industry wide knowledge on all things heat pumps and renewable energy. If you decide to choose Pure Electric for your project, you will have chosen a high quality team of dedicated professionals with the expertise to deliver results for you. Interested in any of our services or products? Then head over to our free quote page to start your all electric journey! Either inhouse or through our strategic partners including TrueDemand we offer our deep experience on energy for clients of any size. Our solutions are designed to save you money while always giving you a competitive and streamlined service. Talk to us about saving on your bills. Our experienced team will rapidly transform your life to give you pure electric freedom. We help you upgrade everything from old fossil fuels to electric efficiency with solar.